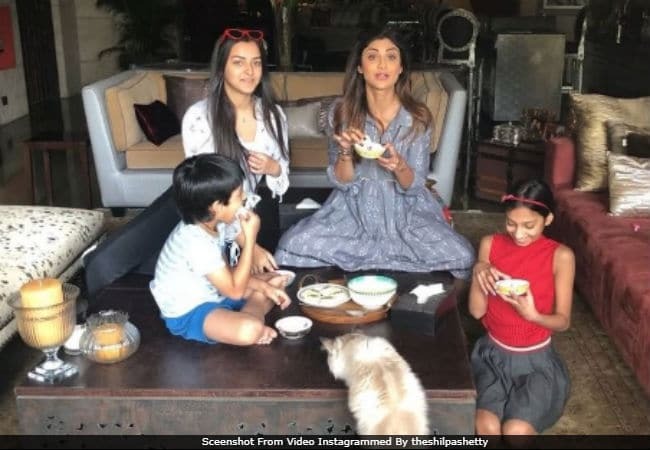 Actress Shilpa Shetty was joined by son Viaan for her famously indulgent binge session, which she has named 'Sunday Binge.' The mother-son duo, along with the actress' nieces, competed for a 'rosogolla challenge.' Who was the winner? Of course, Shilpa. But, Viaan totally stole the spotlight from his mom with his adorable expressions. "Sunday Binge was rosogolla challenge, with my nieces and son and clearly I won. Yay," Shilpa, 42, captioned her post. The Kundras also went out for brunch on Sunday. Shilpa's sister Shamita also accompanied them and posted a picture. "Sunday brunch with family," she wrote, adding a heart emoticon. Take a look at Shilpa and Viaan's 'Sunday Binge' video. Here's their picture from their Sunday brunch. On Saturday, Shilpa, Raj and Shamita went out for dinner at a restaurant in Mumbai's Bandra. Shilpa looked lovely in a white dress. She and Raj entered the venue hand-in-hand. Shilpa married businessman Raj Kundra in November 2009. Their son Viaan was born in 2012. Shilpa Shetty is the star of films such as Baazigar, Dhadkan, Life In A... Metro and Apne. She last appeared in a special song sequence in Karan Johar's Dostana. She is also a yoga expert and has released a range of yoga fitness videos. In 2014, Shilpa produced her first film Dishkiyaoon. She has co-judged dance reality shows like Jhalak Dikhhla Jaa and Super Dancer. Her sister Shamita is also an actress and debuted in 2000 with YRF's Mohabbatein. She has starred in films like Fareb, Zeher and Bewafaa.